South African Airways specials booked via SouthAfrica.TO qualify to earn exclusive travel vouchers. Email a writeup of your flight to cheapflights@southafrica.to & we'll send you vouchers to discount the cost of your next trip. Looking for a bargain? Here's the latest SAA flight specials in South Africa, compiled by South Africa Travel Online. All prices on this page are for one-way flights, unless specifically mentioned otherwise. Prices always change rapidly from the point the air flight special is announced, and unless it's the morning of the date of the special it's likely that it's sold out. If there are no specials, then we survey SAA airfares. SAA became the second airline to achieve Stage 2 of the IATA Environmental Assessment Program (IEnvA). Want to make sure you get the best deal on SAA? Simply book your SAA flight on SAA's website and then you'll have 24 hours to shop around. If you can find the same flight for more than R50 cheaper, they will not only match the flight but give you double the difference back! You'll have to complete a claims form and wait for the return. Terms and conditions apply on this offer. Alternatively you can use SouthAfrica.TO discount vouchers to reduce your flight price immediately. 3 January 2019: Save on SAA flights between Johannesburg and Mauritius when booking before the 10th of January 2019. Travel on selected dates between 10 January and 12 March 2019 to save. 26 February 2019: Celebrate the best of rock music this March with the Rock on the Lawns festival. This one-day festival takes place in Cape Town on the 21st of March 2019 at the Kenilworth Race Course. The amping line-up includes rock legends The Cure and many more local acts. Flights listed below departs on the 20th of March 2019. 20 Nov 2018: Save on flights from Johannesburg to Mauritius when booking before 26th of November 2018. Flights departing on selected dates between 15 Jan - 9 March 2019 start from R6,358*. Find more details here. 20 September 2018: Experience the magic of Christmas in London's Carnaby Street when the festive lights get switched on on the 8th of November 2018. The bubbly street with its luxury stores and magical festive display makes for the perfect one-stop Christmas shopping destination. Flights listed below depart on the 7th of November 2018. We suggest you travel with a bag half-empty to ensure you have enough space for all the Christmas pressies! 27 September 2018: Save on flights to Mauritius when departing from Johannesburg and Durban. Flight prices start from only R6,580* when booking before the 31st of October and travelling between 15 January and 9 March 2019. Find all the details here. 6 September 2018: The lasting legacy of Princess Diana extends far beyond her important charity work to lesser important, but equally memorable, aspects of her life like her carefully curated closet. Princess Diana's transformation from shy young girl to empowered woman is mirrored in her fashion choices, now all on show in Kensington Palace's latest exhibition called Diana: Her Fashion Story. The exhibition includes some of her most memorable outfits including her velvet blue Travolta dress designed by Victor Edelstein. This glamorous exhibition will be on show until 28 February 2019. Flights listed below depart on 15 November 2018. 20 August 2018: Fancy a tea at Buckingham palace? Then you might want to learn more about the Buckingham Palace Summer Opening which allows visitors to explore the palace's State Rooms. Each summer, between July and September 2018, visitors who are subjected to airport-like security checks can roam the 19 states rooms which feature ornate details and beautiful chandeliers. You'll have to take a mental image though, as no pictures are allowed. Similarly that tea you're craving will have to be bought from the official cafe on sight. At least then you can say you've officially had tea at Buckinghams. We promise we won't tell if you don't! Flights listed below depart on the 20th of September 2018. 20 July 2018: The Frieze London Art festival is your chance to discover some of the most exciting emerging artist and rediscover the classics . Featuring work from over 160 galleries around the world, between the 4th and 7th of October 2018, you can view these pieces at Regent's Park. The schedule also includes talks, performances and other events taking place across London. Flights listed below depart on the 3rd of October 2018, but be sure to leave some room in your luggage. You never know when the urge to invest in art might strike! 22 June 2018: Don't miss this unique exhibition of Mexican artist Frida Kahlo's personal effects. Over 200 items of clothing, personal photos and items revealing Kahlo's medical history will be on display in London's V&A Museum until the 4th of November 2018. Far more so than any previous exhibiton, this showcase gives attendees a glimpse into her life and struggles. This intensely personal display is a must-see for all Frida Kahlo fans. Flights listed below depart on the 18th. 5 July 2018: Save on flights from Johannesburg, Durban and Cape Town to Mauritius when booking before 15 July 2018. Flights departing between 18 July - 26 September 2018 and 9 October - 30 November 2018 start from R5,902*. Find more details here. 31 May 2018: The Henley festival is brightening up the British concert scene this summer. Taking place from 11 until 15 July 2018, the diverse line-up includes stars like Grace Jones, Rita Ora and Nile Rodgers. Before you pack your wellies, this is a festival with a difference. The black tie dress code sets it apart from the rest. Instead of foodtrucks and beer stands you can expect pop-up restaurants with proper cutlery and lashings of Moet. Don't miss this not-for-profit event is one not to be missed! Flights listed below depart on the 10th of July 2018. 20 April 2018: The Royal wedding is the highlight on many Brits' calendar. Make your way over to Windsor for a chance to catch a glimpse of the much speculated about dress of the year. Alternatively catch some rays as the English spring finally rears its head. Enjoy some time outdoors in one of the many beautiful parks or partake in an outdoor festival. Flights listed below depart on the 17th of May 2018, giving you just enough time to iron your wedding outfit. 13 April 2018: Can't make it to the Rio Carnival? No worries! London isn't called the culture capital of the world for nothing! The Notting Hill Carnival, taking place from the 25th until the 27th of August, is Europe's biggest street festival and closely resembles the Rio Carnival. Dating back to 1964 this carnival celebrates London's Caribbean communities. Flights listed below depart on the 24th of August 2018. 23 March 2018: The Greenwich+Docklands International Festival is a free outdoor festival celebrating the performing arts taking place between the 22nd of June and the 7th of July 2018. Think small theatrical productions, acrobratic shows and contemporary dance shows among other. Flights listed below depart on the 21st of June 2018. 16 March 2018: Celebrate the ultimate in UK football and attend the FA Cup Final in London on 14 May 2018. Be sure to plan your outfits according to your team colours, although red seems to be a safe option with Arsenal and Liverpool being favourites. Flights listed below depart on the 13th of May 2018. 9 March 2018: Tired of boring museums where all the art starts to look the same? Then you might be interested in Sonica, Glasgow's mini festival of sound art. The two-day taster experience will be taking place in London on the 20th and 21st of April 2018 and will include such wonderful oddities as "Lakker AV" which fuses techno-style sounds with the stunning visuals or glaciers that they conjure in your mind. Flights listed below depart on the 19th of April 2018, but don't expect the in-flight entertainment system's selection to satisfy your recent musical tastes. 2 March 2018: Relive the spirit of Woodstock, one of the greatest festivals to ever take place with this two-day concert. Whilst the original festival featured legends like Janice Joplin and Hendrix the Summer Of Love: The Spirit Of Woodstock, will feature two live sets including their resident band and DJ to fill any silences between main acts. Make sure you don't miss out on this rocking concert taking place in London's Camden Town on the 30th of March 2018. Flights listed below depart on the 29th of March 2018. 2 February 2018: Join hundreds as they celebrate the fire breathing Glastonbury spider's tenth birthday with a two-day festival on the 5th and 6th of May 2018. The Arcadia festival, dedicated to the spider built from reclaimed military hardware, will feature an impressive line up including Leftfield, Rudimental and Groove Armada. Flights listed below depart on the 4th of May 2018. Unlike Glastonbury, wellies are more of an optional accessorie than a requirement at this festival. 19 January 2018: See London in a new light, quite literally, with the Incredible Lumiere Light Festival taking place on the 18th of February 2018. Transforming buildings on both sides of the Thames, the impressive installation includes work from various artists. So put on your thermals and discover Westminster Abbey, the National Theatre, Kings Cross and many more sights. Flights listed below depart on the 16th of February 2018..
12 January 2018: Be transported to Thailand with the 23rd Orchid Festival taking place on the 10th of February until the 11th of March 2018. The Kew Gardens festival is turning the spotlight on the plantlife of Thailand this year, presenting beautiful corners and collections resembling those found in Thai gardens. We've priced flights to London departing on the 9 February 2018 below just in time for the opening of the show. 22 December 2017: Support animal right, a healthy lifestyle and delicious food at the Vegan Life Live London event taking place on the 10th of February 2018. Whether you're committed to this way of life or simply want to dip your toe in first, this event is the one for you. Meet like-minded people, discover new products and most importantly taste great food. Flights listed below depart on the 9th of February 2018. 15 December 2017: Having a pint or two is a great way to stave off the cold, but from the 16th until the 18th of March 2018 it is practically required to do in your finest greens! Celebrate the life of St Patrick with a three-day celebrations inhis honour. Be sure to pack your greens, keep the hangover remedies at the ready and enjoy three days of festivities all over London. Flights listed below depart on the 15th of March. 1 December 2017: Celebrate Scottish poet and lyricist Robert Burns in the only way any Scott should ever be celebrated - with a full on feast! You might not be familiar with the man himself, but works like "Auld Lang Syne" are still popular today with this particular song often sung at the end of the year. Expect lots of kilt-wearing men, streed food (perhaps avoid the haggis if you're not familiar with it) and of course whiskey at the feast. This annual celebration always takes place in London on his birthday, the 25th of January. Flights listed below depart on the 24th of January 2018. 24 November 2017: Think pancakes are strictly reserved for breakfast? Then you haven't experienced Pancake Day celebrations in London yet. This traditional feast day precedes Lent, the period of fasting before Easter, and the large variety of fillings and flavours available during the festival is guaranteed to convert even the most comitted vegan. Festival activities iinclude a charity pancake race and of course lots of pancake snacking. Flights listed below depart on the 12th of February, getting you to London just in time for the ultimate treat on the 13th of February 2018. 17 November 2017: Get into the Christmas spirit with the Portobello Winter Festival taking place on the 9th and 10th of December 2017. Think traditional choirs, calypso music and Moroccan performances as well as a real life Father Christmas. The Made in London Christmas market in Tavistock Square is also the perfect opportunity to finish your Christmas gift shopping. Flights listed below depart on the 8th of December 2017. 10 November 2017: The annual London Art Fair unites over 100 art galleries under one roof, showcasing some of the best artworks from the 20th century, and is the perfect opportunity to bulk out your art collection. Taking place at the Business Design Centre from the 17th until the 21st January 2018, the fair will also showcase a curated contemporary photography collection and a smaller exhibition focusing on up and coming artists. Flights listed below depart on the 16th of January 2017. 3 November 2017: Make your children's school holiday one they can't forget with a once-in-a-lifetime show with a iceskating princess. Cinderella on Ice is coming to the Montecasino from 1st of December until the the 6th of January 2018. Flights listed below depart on the 8th of December 2017, giving you more than enough time to work in a few holiday activities before the festive season. 27 October 2017: South African singer-songwriter and all-round badass lady Karen Zoid is performing at the Spier Amphitheatre this November. She is one of those unique artists who not only bridged the gap between popularity and critical acclaim, but also managed to attract a large English fanbase despite the fact that most of her songs are Afrikaans. Make sure you don't miss out on this lady's passionate performance on the 26th and book your flight tickets for the 25th of November 2017 today. 20 October 2017: Experience some of the best flavours and aromas London has to offer at the Taste of London festival taking place from the 16th until the 19th of November 2017. With some of the city's best chefs preparing signature tasting dishes to cocktail and cooking classes, come hungry and come ready to be inspired! You'll also have the chance to browse over 100 artisanal stalls and take home sweets, snacks and beverages to continue the experience at home. Flights listed below depart on the 15th of November 2017. 13 October 2017: London's premier Jazz Festival is back on the 10th until the 19th of November 2017. The festival includes multiple events spread over various venues in London like the Barbican, Royal Festival Hall, Kings Place and more. This year's line-up heavyweight musical talent from across the globe, like Imaani & Noel McCalla, Nicole Henry and the Bill Charlap and Stephen Keough. With over 350 performances in over 60 venues, various of them being free, there really is no excuse to miss this! Flights listed below depart on the 9th of November 2017. 6 October 2017: The Christmas Festival at Royal Albert Hall taking place from the 13th until the 24th of December can put even the Grinch in the festive mood! From daily Christmas carol events to the Christmas concert, they'll have you singing jingle bells before too long. And if the Christmas Festival somehow fails in getting you in the mood, may we suggest a walk down Oxford street? If those lights, shop displays and carols don't get you in the festive spirit nothing will! Flights listed below depart on the 12th of December 2017. 29 September 2017: Ever felt like you've lost touch with your inner child? Then the After-School Club at The Natural History Museum might be exactly what you need. Reconnect with your youthful side with activities like face painting, designing a prehistoric dinosaur t-shirt and a silent disco - all with the help of a bar. This event in partnership with Time Out takes place on the 20th of October 2017. Flights listed below depart on the 19th of October 2017, but maybe keep your onboard silent-disco to yourself? 22 September 2017: Remembrance Day, otherwise known as Poppy Day, marks the end of the First World War, then of course known as the Great War. Around the world millions take 2 minutes of silence on the 11th of the 11th in honour of those who gave their lives during the battle and subsequent wars. Trafalgar Square is a popular gathering place and is usually filled with poppies for rememberance, it makes quite the scene. Flights listed below depart on the 10th of November 2017, giving you just enough time to see the spectacular display. 15 September 2017: You know how the saying goes, you can't even gossip in Afrikaans on the tube as London is overflowing with Saffas. It is not just South Africans though, the whole of Africa is axpanding! So much so that the Mayor of London is celebrating black history month with an African festival in Trafalgar Square. So if you're feeling a little home-sick or just simply proud of how far some have come, make sure you don't miss out on this spectacular display of African pride on the 14th of October 2017. Flights listed below depart on the 13th of October 2017. 8 September 2017: Dating back to the 16th Century, the Lord Mayor's Show is an ancient tradition where the appointment of a new Lord Mayor of the City of London is celebrated with an elaborate street parade. Today the parade includes elements of British pageantry and carnival. Although the Lord Mayor no longer holds an official title, with the London Mayor now governing the whole of London, this tradition is kept alive to serve as a reminder of the important role the historic small centre of London played. Flights listed below depart on the 10th of November 2017. 1 September 2017: This year marks the 25th EFG London Jazz Festival, with ten days of music from both jazz legends to emerging artists. Consisting of various concerts, event and performances at different locations, it allows you to pick and choose which you want to attend. The festival runs from the 10th until the 19th of November. Flights listed below depart on the 9th of November 2017. 25 August 2017: A true celebration of colour, love and Indian culture, this year's Diwali Festival takes place on the around the 19th of October or when the new moon appears. Join London's early celebration this year on the 15th of October at Trafalgar Square, with yoga lessons, henna stations, craft activities and traditional Indian food. Celebrate the triumph of good over evil and catch a flight to the Big Smoke on the 14th of October 2017. 18 August 2017: Wanderlust 108 London is a triathlon with a difference, one that most can get behind. It combines a 5 km run, yoga session and medition with optional extras like a healthy lunch and live entertainment. So pack your mat, your running shoes and take some time to really unwind in London on the 23rd of September. Flights depart on the 22nd of September 2017. 04 August 2017: The London Design Festival celebrates and promotes the Big Smoke as design capitol of the world. From the 16th until the 24th of September various venues and institutions will be participating with special exhibitions, shows and installations. Make sure you don't miss the #desingjunction at London's Kings Cross station. Flights listed below depart on the 15th of September 2017. 28 July 2017: The annual Open House London event takes place on the weekend of the 16th and 17th of September and allows visitors to see inside buildings that are usually off limits to the public. Noteworthy buildings that have opened their doors for previous events include 10 Downing Street, The Pavilion and the Buddhapadipa Temple. Some offer guided tours and others allow you to explore on your own, but one amazing thing they all have in common is that it is free! No excuse for not seeing more than the average tourist! Flights listed below depart on the 14th of September 2017. 14 July 2017: Celebrate the very best of German culture without braving the language barrier with the London Oktoberfest taking place from the 28th of September until the 8th of October 2017. Think copious amounts of beer to beat the chill and delicious snacks like bratwurst, schnitzel and brezel. Now the only question is whether the dirndl should come out to play? The festival spans over two weeks, with tickets available for either week 1 (28 September - 1 October) or week 2 ( 5 October - 8 October). Flights listed below depart on the 27th of September 2017. 06 July 2017: The three-day One Love Festival is the ultimate celebration of reggae and dub music, keeping the spirit of Bob Marley alive! From the 1st until the 3rd of September 2017 London's Tunbridge Wells will see the likes of King Tubby Sound System, Derrick Morgan and Channel One Sound System keeping the genre alive. Flights listed below depart on the 31st of August 2017. Might we suggest saving the red, yellow, green and black for the festival? No one wants to be subjected to additional security checks! 30 June 2017: Taking its name from the neighbourhood it is in, the South West Four is an two-day electronic music festival taking place in the Clapham Common. On the weekend of the 26th until the 27th of August 2017 international and local house, techno, EDM and drum and bass acts will take the stage. Headline acts include Pendulum and Deadmaus among many others. Flights listed below depart on the 25th of August 2017. 23 June 2017: The 51st State Festival is a music festival dedicated to celebrating the very best US House, Garage, Soul, Disco and Caribbean sounds taking place in London on the 5th of August. With bars dotted accros Trent Country Park and a dedicated VIP area, the festival aims to make drinks and other essentials easily accessable to everyone. Make sure you don't miss out on this unique experience and book your flights for the 4th of August 2017. 12 May 2017: This year's theme, #nofilter, really encapsulates the essence of the LGBT community's Pride in London Parade. Saying everyone should come as they are, requesting everyone to "just be you". The march taking place on the 8th of July 2017 usually provides the dull streets of London with some much-needed colour and is definitely something not to miss, whether you choose to partake or be a supportive onlooker. Flights listed below depart on the 7th of July 2017. 7 April 2017: Celebrate the love of Prince's music with like-minded souls at the When Doves Cry concert which runs from the 14th until the 21st of April 2017. This is your chance to dance the night away! Flights listed below depart on the 13th of April 2017. 17 March 2017: Making your way to London this spring and trying to find the best sight-seeing tour? The London Marathon might seem like a weird suggestion, but as it take in all the best views (Tower Bridge, Parliament and Buckingham Pallace) and allows you to set your own pace, it really does make one of the best out there. Added bonusses include a chance to meet a jovial crowd of locals, the fact that it is more affordable than some tours and it sure beats the hotel gym! The London Marathon takes place on the 23rd of April 2017, not leaving much time for training sessions. Flights listed below depart on the 22nd of April 2017 and should get you to the start line just in time. Luckily there is no jet lag involved! 24 February 2017: A must see for all 90's kids, the Adventures in Moominland exhibition at London's Southbank Centre, is an interactive exhibition exploring the much loved Moomin Family. With a focus on author Tove Jansson, the exhibition showcases sketches, influences the the personal affects of the author to provide more insight into the childrens classic. Make sure you don't miss the exhibition which runs until the 23rd of April 2017. Flights listed below depart on the 22nd of April 2017. 17 February 2017: One of the most iconic movies ever, The Godfather, will be given the live orchestra treatment at London's the Palladium on the 11th of March 2017. Francis Ford Coppola's award-winning film is a must-watch for everyone and can only be improved with the addition of a live orchestra. More than 40 years since its initial release it is still topping the charts as the best movie ever. Nino Rota’s epic score performed live will only add to the drama. This is an opportunity not to be missed by any film enthusiast. Flights listed below depart on the 10th of March 2017. 3 February 2017: Celebrating more than ten years together, electropop band Fenech-Soler is performing in London on the 1st of March 2017. The concert i in support of their new album, Zilla, which dropped today and will likely feature some new material. If you enjoy the sounds of Friendly Fire and Delphic this is definitely a band to look out for. Flights listed below depart on 28th of February 2017, allowing you to catch up with London's hot music scene. 26 January 2017: British comedian Russel Howard is returning to the stage for the first time in three years with his show Round the World. From the 1st until the 10th of March, Howard will perform at London's prestigious Royal Albert Hall, making him the first stand-up comedian to perform ten consecutive shows at the venue. Don't miss his unique feel-good comedy examining life's simple pleasures. Flights listed below depart on the 28th of February 2017. Tickets for the show might be harder to come by! 9 December 2016: Indie alternative band The Japanese House is touring the United Kingdom next year. Make sure you don't miss out on hit songs like Pools to Bathe In and Face Like Thunder by booking your seats today! Although they will be making various stops in the UK, they'll be in London from the 25th of March until the 25th of June 2017. Flights listed below depart on the 2th of March 2017, to allow you ample time to pack in a few touristy activities and one of the first shows. 2 December 2016: The Grimaldi Service might be one of the weirdest around and certainly isn't for anyone with coulrophobia. Each year on the anniversary of Joey Grimaldi's death (5 February 2017) thousands of clowns, harlequins and jesters gather at Dalston Church to pay respect to the man tributed with inventing the modern clown. Over the years the Clown's Church Service has evolved so that attendees also pay respects to others with big feet, rubber noses and crazy hair who have passed away over the last twelve months. If you find yourself fascinated by them or simply want to pay your respects, make sure you don't miss out with flights listed below departing on the 4th of February 2017. 25 November 2016: Relive the Pokemon series with this orchestrated concert of popular songs related to the franchise as well as music from the games. The show has travelled all over the world, with a set list that includes well over 20 songs. Make sure you don't miss out on the show on the 19th and 20th of December in London's Eventim Apollo theatre. Flights listed below depart for the big smoke on the 18th of December 2016. 28 October 2016: If ever there was a time to tackle your bucket list, it is now! With London's Travel Adventure Show just around the corner (21 January 2107), you'd better draw up that list now. With four theatre's and over a 100 free inspirational talks, you'll not only leave with a plan but with the motivation to follow through on your plan. You'll get the chance to meet specialist adventure travel companies, improve your travel photography, travel writing and adventure filming seminars and meet like-minded adverturists. What are you waiting for!? Book your flights to London on the 20th of January 2017 now. 14 October 2016: London's winters may get dreary if it wasn't for the slew of fun festival and celebrations taking place over the festive season. On the 18th of November the Hyde Park Winter Wonderland opens with markets, festive fairground rides, ice skating, grottos and glühwein galore. Come catch the festive spirit and book your flights for the 17th of November 2016. 7 October 2016: Celebrate London's new Lord Mayor (the annually elected ambassador of the City of London) in style with the city's Lord Mayor Show and Fireworks. This is one of London's biggest events and will certainly be a lot of fun with a 3,5 mile procession streching from Bank until Aldwych. More than 7000 performers will fill the streets with 200 horses, more than 150 floats, live music, dance, acrobatics and colourful costumes. Don't miss the theatrical fireworks show that follows the river pageant. This promises to be one memorable day! Flights listed below depart on the 11th of November 2016. 30 September 2016: Celebrate winter in London with the Southbank Centre Winter Festival taking place from the 11th of November until the 25th of January 2017. Think Christmas Markets and Roller Disco - everything you need to stay warm this snowy season! Flights listed below depart on the 10th of November 2016. Make sure to pack warm and take your woolies with you on the flight- no one wants to open a suitcase in Heathrow looking for a coat! 23 September 2016: If you're dreaming of a white Christmas, London is always a good idea! Whether it will be freezing or snowing, we can't guarantee but with a slew of Christmas festivities and affordable flights - the Big Smoke is an ever-popular option. If you find yourself in London between the 11th of November and 8th of January, you have to make your way to Leicester Square. Smack-bang in the middle of the city, the square will play host a Christmas market with a vintage Spiegeltent (wooden hall), the La Soirée circus and Santa's Grotto. Entry to the sqaure and market is free, but there is a fee for the circus and Santa's Grotto. Flights listed below depart on the 10th of November 2016 - a great time to take advantage of low-season flights! 26 August 2016: 16th Century artist Caravaggio's significant contribution to classic art was nearly forgotten after his untimely death in the early 1700's. It is only in the 20th Century that the importance of his work was rediscovered when the Dutch masters, Italian, French and Flemish artists all started referencing his realism and dramatic use of light and darkness. Beyond Caravaggio is the first UK based exhibition that explores the importance of his works in the context of those who he inspired. Don't miss the beautiful display of Caravaggesque style in London's National Gallery from the 12th of October 2016 until the 15th of January 2017. Flights listed below depart on the 11th of October 2016, giving you little time to brush up on art history. 19 August 2016: Renowned modernist artist Pablo Picasso's career spanned several decades and saw him progress from classical works to pioneering modernism in the art scene. Perhaps more than anything, his portraits epitomises his innovation and progression with a strong personal connection to all his subjects - friends, lovers and family members. From the 6th of October 2016 until the 5th of February 2017 the London Portrait Gallery will display over 80 portraits of Picasso's loved ones. The exhibition will cover everything from his realist paintings created during his teenage years to his later modernist canvasses, creating a beautiful timeline as he drawing started drawing from life to later creating humorous caricature and expressive paintings from memory. Don't miss this once in a lifetime opportunity to experience the artists best works in real life. Flights listed below depart on the 5th of October 2016. 12 August 2016: Dating back to the 19th Century, a street sweeper started a charitable service called the Pearly Kings and Queens. To this day, the charity continues today with the street sweepers great granddaughter continuing the tradition and many Pearly Kings and Queen who join in. If you want to be part of the fun on the 25th of September 2016, you should pack a black suit covered in pearly buttons in your hand luggage and catch a flight to London n the 24th of September. Who wouldn't want to walk the streets of London in a ridiculous outfit, having a laugh and gathering money for a charity? 29 July 2016: London's Thames brings life to the big smog in more ways than one, so taking a trip along the river offers tourists the perfect opportunity to take in all the sights. The Royal Greenwich Tall Ships cruises will take you from the Greenwich Heritage Centre past some amazing sites like the The O2 and Statue Peter the Great. So don't miss out on this magical journey, taking place for groups from the 14th until the 18th of September 2016. Flights listed below depart on the 13th of September 2016. 15 July 2016: South African-born alternative rock band the KONGOS are making their way to back to local shores this August! The four brothers will perform in Cape Town and Johannesburg for the Oppikoppi Festival and have also scheduled a concert in Durban's Botanic Gardens. So save the 3rd of August 2016 for an evening of rock. Flights listed below depart on the 2nd of August 2016. 24 June 2016: Underground music is alive and well in Hackney with the Visions Festival having sold out the last two years. Now in its fourth year, Visions brings more than just a great on-stage lineup with various street food stalls, exhibitionsand the like also forming part of the experience. Expect to see up-and-coming artists like Young Fathers, Anna Calvi, Mykki Blanco and Gengahr before they are cool. Make sure you don't miss the festival on the 6th of August 2016. Flights listed below depart on the 5th of August 2016. 17 June 2016: Ever wondered how the royals live? Then you have to make your way to London between the 23rd of July to the 2nd of October 2016 to visit London's Buckingham Palace, one of the last remaining palaces housing royalty. This is your opportunity to explore the state rooms, with artworks by the Dutch masters, exquisite examples of Sèvres porcelain and some of the best French and British furniture ever created. In celebration of the Queen's 90th birthday, this year's special exhibition will be dedicated to outfits the Queen has worn. Make sure you don't miss out and book your flights for the 29th of July 2016. 27 May 2016: Celebrate simpler times with the Lambeth Country Show which brings some country charm to the south of London on the 16th and the 17th of July 2016. In its 42nd year already, the show includes the famous vegetable sculpture competition and offers you the opportunity to emerge yourself in country life by shearing sheep and participating in a hula hoop workshop among other quaint activities. Flights listed below depart on the 15th of July 2016. 19 May 2016: South African Airways is currently running amazing weekly deals on domestic, regional and international flights from Johannesburg. Get all the details here. 13 May 2016: Celebrate summer with live music in the park on the 15th and 16th of July 2016. This year's Lovebox festival includes Major Lazer, LCD Soundsystem, Jungle and Run the Jewels along with emerging artists. The two-day festival takes place in Victoria Park and is not to be missed. Flights listed below depart on the 14th of July 2016. 6 May 2016: Star Wars fans have more reason to smile than most, with multiple films in the pipeline, rumours of spin-off stories and a television series making the future look all bright and shiny! To help them forget about Episode 1-3, Lucasfilms are hosting a whole weekend dedicated to the fans. Grab your lightsaber and don't miss out on the adventure that includes several fan panels, exclusive merchandise, celebrity guest stars, screenings, exhibits and so much more from the 15th until the 17th of July 2016! Unfortunately these flights won't take you to a galaxy far, far away but they do all depart on the 1th of July 2016. 22 April 2016: Ever wondered where you could find the most English roses? The answer is London of course! On the 18th and 19th of June 2016, Open Garden Squares Weekend allows you the magical opportunity to see a large variety of private, hidden and community gardens in London. Participating gardens vary greatly, each offering something unique like beekeeping or live music. So pick your garden, pack your picnic and spend a day catching some rays in a beautiful setting. The complete list of gardens is available online. Flights listed below depart on the 17th of June 2016. 15 April 2016: Celebrate with London's gay and lesbian pride community as they bring London alive with the Pride in London Parade on the 25th of June 2016. The colourful parade's route includes Baker Street, Oxford Street, Regent Street, Piccadilly Circus, Lower Regent Street, Pall Mall and Trafalgar Square. Make sure you don't miss out and book your flights for the 24th of June 2016. 8 April 2016: Get the West End experience without the price tag! Make your way to London's Trafal Square on the 18th and 19th of June 2016 to catch snippets of some of the most popular plays performed alfresco. This year's line up hasn't been confirmed yet, but expect to hear some of the most popular West End musicals. Whatever you do, resist the urge to sing along on your flight to London on the 17th of June 2016! 1 April 2016: This year the long awaited follow-up to the Harry Potter saga is finally making its West End stage debut. The two-part play picks up 19 years from where we last left Harry. The play made waves when a Swaziland-born actress was cast as Hermione, after which Rowling quipped that people only assumed Hermoine was caucasian and that her race and skin colour was never mentioned. Indulge your inner child and book your tickets before it is too late! The play starts on the 30th of June and ends in May 2017. Flights listed below depart on the 6th of June 2016. 4 March 2016: What could be more iconic than catching a William Shakespeare play in London? Well luckily from the 30th of April 2016 you can catch A Midsmmer Night's Dream at the Globe Theatre. Flights listed below depart on the 29th of April 2016. 26 February 2016: More haute couture than bargain basic, Undressed: A brief history of underwear showcases some of the best underwear we have seen in quite a while. Think black lace, delicately embroidered stockings and Queen Victoria's ample long johns. Don't worry though, this exhibition is rather pleasing on the eyes with a whole section dedicated to underwear-inspired outerwear designed by the likes of John Galliano and Antonio Berardi. Make sure you don't miss the exhibition at the V&A in London from the 16th of April 2016 until early next year. Flights listed below depart on the 15th of April 2016. 19 February 2016: Not content with just any cuppa joe? Then you'll be pleased to learn of the London Coffee Festival, celebrating everything that makes the perfect blend. The biggest coffee and artisan festival in the UK takes place from the 7th until the 10th of April 2016 and includes everything from gourmet coffee, speciality tea, artisan snacks and live entertainment. Here is to hoping you're not bothered with a bikini body! Flights listed below depart on the 6th of April 2016. 12 February 2016: The Circus Festival 2016 will bring three weeks of contemporary circus acts and entertainment to London's Roundhouse. Some of the performances are daring, others are world-firsts and some question the cultural significance of circus acts. Apart from the usual acrobatic acts, the festival will also include a Take Part Weekend of workshops and classes on acrobatics, street dance, aerial skills and the hula hoop. So don't miss this circus extravaganza and make sure you're in Lodon between the 4th and 24th of April 2016. Flights listed below depart on the 3rd of April 2016. 5 February 2016: The London Marathon, dubbed the "historical jog around London", snakes through London past the Tower Bridge, Coca Cola London Eye, Tower of London and Buckingham Palace. The 42.2 km run is equally popular among locals and tourists, with many celebrities having crossed the finish line. If donning your running shoes isn't really your thing, make sure you head to a pub along the route and secure your seat early. Each year London becomes a 42.2 km long street party. So whether your packing your running shoes or headache tablets, make sure you get to London by the 24th of April 2016. Flights listed below depart on the 23rd of April 2016. 29 January 2016: Considering the succes of musician-based exhibitions like the David Bowie one at the V&A Musuem, it should come as no surprise that the Rolling Stones has one of their own. Rock legends like the Stones will undoubtedly have thousands of tour and recording memorabilia as well as awards. Being dubbed as an “interactive tour through the Rolling Stones’ vast artistic oeuvre”, the exhibition will include original stage designs, dressing room and backstage paraphernalia; rare guitars and instruments, iconic costumes, rare audio tracks and unseen video clips; personal diaries and correspondence; original poster and album cover artwork, and unique cinematic presentations. It will also include some of their collaborations with creative talents. So take a flight to London on the 4th of April 2016 and head to the Saatchi gallery to view the Rolling Stones: Exhibitionism from the 5th of April until the 4th of September 2016. Be sure to get your exhibition tickets before it is too late. 25 January 2016: The term "affordable art" has been used increasingly often to refer to the works of up-and-coming artists. Buying art before the artist makes a name for himself can be a great investment, but also risky. The Affordable Art Fair Battersea takes some of the risk out of the equation, with 110 galleries showcasing orginal art works starting from as little as £100. This is your chance to grab something unique for your home. So don't miss out on the art fair from the 10th to the 13th of March 2016. Flights listed below depart on the 9th of March 2016. 15 January 2016: Three years ago craft beer was the preferred drink of hipsters with thick-framed glasses and skinny jeans, but craft beer managed to shake that image to emerge as the drink of choice for the younger crowds. The Craft Beer Rising festival is returning to the Old Truman Brewery with 150 brewers taking part in this year's event. Think cheap bear, great live music and the ability to stock up on your favourite brew (or cider, for that matter). Don't miss out on the beer event of the year on the 26th of February 2016. Flights listed below depart on the 25th of February 2016. 8 January 2016: British singer-songwriter Craig David presents TS5, his sell-out DJ show in London on the 3rd of March 2016. During the show's UK launched Craig debuted his new song "Cold". We're sure you wouldn't want to miss out on what he does this time around! Flights listed below depart on the 2nd of March 2016. 18 December 2015: Spinning is taken to a whole new level in the UCI Track Cycling World Championships taking place in London from the 2nd to thr 6th of March 2016. Whether you're interested in competing or simply want to watch the world's best cycle around the Lee Valley VeloPark, you can't miss this. Don't forget to add your bicycle to your SAA flight before your departure! And remember to carbo load at one of London's many Italian restaurants. Flights listed below depart on the 1st of March 2016. 4 December 2015: The Lumiers have taken it upon themselves to brighten London during the dreary winter season, when Christmas lights and New Year's fireworks are only a distant memory. From the 14th until the 17th of January 2016, London will become a magical city illuminated by artists from around the world. Head to the West End or King's Cross for this spectacular display. Flights listed below depart on the 13th of January 2016. 20 November 2015: Waterbabies and those with a penchant for sailing will appreciate the CWMFX London Boat Show taking place from the 8th until the 17th of January 2016 at ExCeL. This is the perfect opportunity to shop and talk boating and watersports with like-minded compatriots. With over 500 exhibitors you won't want to miss the opportunity, it only comes around once a year! Flights listed below depart on the 7th of January 2016. 13 November 2015: See Dr Suess's The Lorax come to life in David Greig's on-stage adaptation. From the 2nd to the 16th of December 2015 the children's classic will be performed at the Old Vic in London. Flights listed below depart on the 1st of December 2015. 6 November 2015: Is there anything more festive than an evening of carolling?On the 10th of December the halls of Etham Palace will be decked in bells and holly, making it a grand setting for an evening of festivities. This is a great event for the whole family to get into the festive spirits! Flights listed below depart on the 9th of December 2015. 30 October 2015: Nothing beats the magic of a Walt Disney tale, unless it is performed on ice! Dazzling outfits, memorable songs and a hint of nostalgia makes Disney on Ice a must-see for all this Christmas. The show takes place on the 22nd of December 2015 in London. Flights listed below depart on the 21st of December 2015. 27 October 2015: Between the 27th October and 3rd of November 2015, you can score some amazing flights for next year. This sale includes both domestic, international and regional flights. 23 October 2015: English singer-songwriter sensation James Morrison will be performing at the O2 Shepard's Bush Empire, London on the 24th of November. Flights listed below depart on the 23rd of November 2015. 2 October 2015: Get ready for a 10 day celebration of everything jazz related from some of the best up and coming artists to world renowned musicians. The 10 days will include everything from concerts to talks and various learning programmes. So make sure you head to London to between the 14th and 25th of November 2015 to experience the festival for yourself. Flights listed below depart on the 13th of November 2015. 21 September 2015: Celebrate the best contemporary art in London's Regent Park with London's Frieze Art Fair. Staged by frieze magazine's editor, Amanda Sharp and Matthew Slotover, the exhibition will feature more than a 170 contemporary art galleries. Make sure you don't miss this opportunity to collect some unique pieces from the 14th until the 17th of October 2015. Flights listed below depart on the 13th of October 2015. 15 September 2015: SAA is running a domestic flight special to and from Johannesburg! The sale is available on selected dates in December 2015 and January 2016 and can be booked until the 16th of September 2015. 4 September 2015: Celebrate autumn in the best way possible - with a full blown foodie festival! The RHS London Harvest Festival Show celebrates the best seasonal produce with interesting shows demonstrating how to make the best of the late season harvest and even hoe create your own cider. The festival takes place from the 6th to the 7th of October 2015. Flights listed below depart on the 5th of October 2015. 28 August 2015: Know your Sarah Burton from your Christopher Kane? Or want to find out what the best way is to make your metallics look now and not circa 2000's? Then you have to attend London Fashionweekend on the 24th to the 27th of September 2015. With a whole weekend of fashionable excitement like trend shows (instead of one designer) and great shopping opportunities, this is every fashion lovers dream! Flights listed below depart on the 23rd of September 2015. 21 August 2015: SAA is running an international flight special to 5 international destinations! The sale is bookable until the 28th of August 2015 with travel dates until the end of 2015. 19 August 2015: Weekend markets are all the rage, but the Greenwich Vintage Fair promises to be anything but regular. For a weekend filled with classic rock, swing and jazz, cocktail bars and of course vintage goods ranging from clothing to home decor and everything inbetween it promises to be one of the hottest events on the calendar. So make sure you don't miss the Greenwich Vintage Fair On the Gardens taking place in London from the 5th to the 5th of September 2015. Flights listed below depart on the 4th of September 2015. 7 August 2015: Get your dancing shoes ready because it is nearly time for the United Festival! Celebrating over 25 years of some of Britain's rave cuture on no less than 8 stages, it is easy to see why it is a highlight on so many's calendar! So head to Finsbury Park on Sunday the 13th of September 2015 to end your weekend the right way. Flights listed below depart on the 12th of September 2015. 31 July 2015: As summer in London is drawing to a close, so is some of summer's best pop-ups like the London Wonderground. Situated in the Jubilee gardens in London's trendy South Bank area, Wonderground offers comedy, music, cabaret and a circus. Entrance is free but you'll have to pay for any food and drinks, rides and shows. So if you do find yourself in London before the 28th of September, you have to make your way over to indulge in the summer atmosphere. Flights listed below departs on the 26th of September 2015. 17 July 2015: Thought extravagant street festivals were reserved for Rio? Think again! Once a year the prim and proper streets of Notting Hill, London let loose for the Notting Hill Carnival. From the 29th to the 31st of August 2015 thousands will dress up in their brightest nd shiniest outfits to parade the streets. This is something not to be missed! Flights listed below depart on the 28th of August 2015. SAA is running a 24 hour sale on domestic flights which ends at 23h59 tonight, the 15th of July 2015. Selected flights on four different routes are on sale from R875*! 10 July 2015: Think you can build something to rival the Wright brothers' creation? Then you have to go and give it a try at the Red Bull Air Race World Championship in London. The event takes place on the 15th and 16th of August 2015. Flights listed below depart on the 14th of August 2015. 3 July 2015: The Prudential Ride London aims to become the largest charity fundraising event in the world. Covering most of London and Surrey the bicycle tour will take you past world-famous sites like Buckingham Palace, the Tower of London and the Houses of Parliament. The tour benefits multiple charities around the country and takes place on the 1st of August 2015. Flights listed below depart on the 31st of July 2015. 24 June 2015: Couldn't make it in time for the Chelsea Flower Show but want to indulge in the best of floral design? Then you have to experience the Hamptons Court Flower Show. Set on the 34 acre grounds of Hamptons Court Palace. The palace's gardens alone will be enough to sustain any horticulturist's dreams, but add to that marques that exhibit works by some of the best floral designers and nurseries and you won't want to leave! As this year marks the 25th year for the famous show, they will celebrate with a large cake and a 20m hedge maze. The show takes place from the 2nd to the 5th of July 2015. Flights listed below depart on the 3rd of July 2015. 29 May 2015: The performing artists for the Wireless Festival reads like a top 10 album lists with Rita Ora, Ms. Dynamite, Mary J Blidge, Drake, Lamar, Nicki Minaj, David Guetta and so many more. The four day festival starts on the 28th of June and continues from the 3rd of July 2015 Finsbury Park. Flights listed below depart on the 2nd of July. 27 May 2015: SAA is slashing prices for 7 days only, from the 27th of May until the 2nd of June 2015. The sale is only available on flights departing Johannesburg before 31 August 2015. Some of the amazing sale fares include Pert from R10, 885*, New York from R11, 954*, Lagos from R5, 894* and Mauritius from R5, 514*. 22 May 2015: June marks the start of winter and in Cape Town that means rainy season, which is arguably the best time to visit the wine farms as they launch special winter menus that their summer counterparts can't beat! So to get you in the mood for the drop in temperatures, make sure you book your flights to Cape Town and start exploring the Winelands one meal at a time Flights listed below depart on the 5th of June 2015, just in time for the first weekend this winter. 13 May 2015: SAA's Europe Promotional Fare is ending tomorrow. So make sure you book your international flights to London, Frankfurt, Munich, Amsterdam, Dublin and many more before the 15th of May 2015. Flights from Johannesburg to Frankfurt start from R7902*, flights to London from R8746* and flights to Munich from R7699*. 08 May 2015: June marks the start of winter and in Cape Town that means rainy season, which is arguably the best time to visit the wine farms as they launch special winter menus that their summer counterparts can't beat! So to get you in the mood for the drop in temperatures, make sure you book your flights to Cape Town and start exploring the Winelands one meal at a time Flights listed below depart on the 5th of June 2015, just in time for the first weekend this winter. 24 April 2015: If I were to ask you what your winter essentials were I'm sure some good red wine and suitable snacks would be included. Hence the perfection of Stellenbosch's Feast of Shiraz and Charcuterie taking place on the 30th of May 2015, when winter settles in at the Winelands. Stellenbosch has long been known for producing some fine wines, but they have also recently emerged as a champion of fine food with local producers popping up everywhere. So if you want to kick winter up a notch make sure that you attend the festival in Stellenbosch. Flights listed below depart on the 29th of May 2015. 23 April 2015: SAA is currently running an amazing 4-Day International Sale with over 17 international destinations on sale. The sale ends on the 24th of April 2015. Travel period is until the 30th of June 2015. Flights from Joburg to London from R8487*, Joburg to Windhoek from R3076* and Joburg to New York from R11 182*. *Prices are subject to change. 13 April 2015: Do you think your coffee game is on par with your favourite barista? That sliver of doubt means you have to make your way to London for the London Coffee Festival. Celebrating the best beans, brews and (equally important) artisan food. Visitors can learn to replicate their favourite coffee at home and also stock up on the necessary beans and accessories at the event. The Festival opens to the public on the 1st of May and runs until the 3rd of May 2015. Flights listed below depart on the 1st of May 2015. 27 March 2015: Light up London with the Electric Run - a fun 5km run through London town. So bring your running pants and don't worry about the rest as you'll get a limited edition glowing T, LED bradelets and a UV glow body pen to make sure you stand out from the crowd. Flights listed below depart on the 1st of May 2015. 16 March 2015: Enjoy the last days of sunshine outdoors with good food and wine at the Constantia Food and Wine Festival. Taking place from the 17th to the 19th of April the festival celebrates the best in local cuisine and wines. A R160 ticket will buy you one day's entrance to the various wine farms as well as 10 wine tasting tickets. You can purchase some delicious snacks along the way and enjoy the evening concerts at the Constantia Uitsig Wine Estate Cricket Oval. Flights listed below depart on the 16th of April 2015. 12 March 2015: The Indo International Trade & Culture Exibition will be held on the beautiful island of Mauritius from the 3rd to the 12th of April 2015. If you ever needed an excuse to travel to Mauritius, now you have one. The flights below depart on the 4th of April 2015. 20 Feb 2015: The South African Ironman Triathlon takes place in East London on the 29th March 2015. The triathlon takes the average athelete 17 hours to complete with the record set below 8 hours! Those travelling to the competition will want a few days to practice in the new terrain, therefore flights mentioned below depart on the 20th of March 2015. 13 Feb 2015: Imagine sipping on cocktails and dancing the night away on a Mauritian beach as the beautiful island celebrates Independence Day on the 12th of March 2015. Celebrate the evening in traditional creole style with sega dancers and copious amounts of rum! End the evening with fireworks before flyign home the next day. Flights listed below depart on the 6th of March 2015. 6 Feb 2015: Soccer fans wouldn't want to miss the epic clash between the Orlando Pirates and Kaizer Chiefs next month. The Absa Premiership League Match will take place on the 7th of March 2015 at the FNB Stadium in Joburg. Flights listed below depart on the 6th of March 2015. 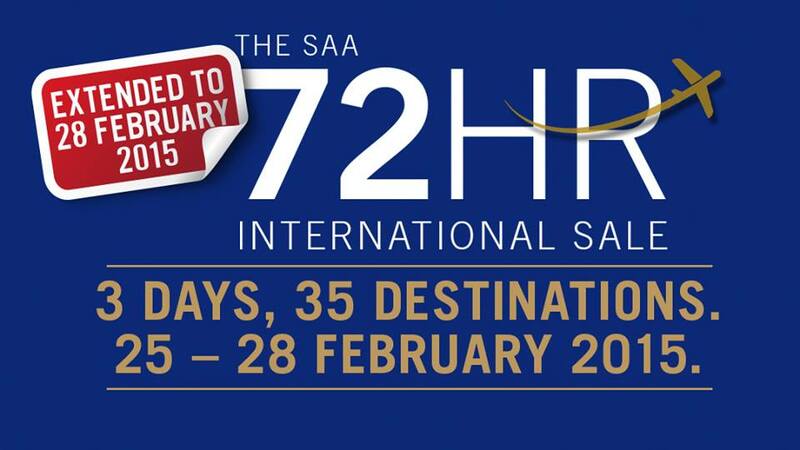 27 Feb 2015: SAA has extended their 3 Day Sale to end on the 28th of February! You can save up to 40% on 35 domestic, regional and international flights if you book before midnight on the 28th of Feb 2015. The sale is on selected dates, excluding peak periods, before the 18th of February 2016. Our pick of the sale is the Johannesburg to London flight which is direct from only R9,143*. *Subject to change, limited availability. 19 Jan 2015: Watching a 2014/2015 World Cinema Season production at the Fugard Theatre in Cape Town is a must for every visitor and we can't imagine a better way to celebrate the month of love than with a viewing of the Bolshoi ballet's Swan Lake. It remains a favourite for good reason. If the tragic love story of Odette and Siegfried doesn't tug at your heart strings, Tchaikovsky's hauntingly beautiful score will. The screening takes place on the 22nd of February at 11 a.m. Flights listed below depart on the 21st of February 2015. 14 Jan 2015: Fly down to Cape Town for the J&B Met taking place on the 31th of January 2015. The Met is Cape Town's biggest horse race event with over 60 000 people heading to Kenilworth for the event. There are still a lot of tickets available for the event. Be sure to dress up for the event! Flights listed below depart on the 30th of January 2015. 24 Dec 2014: Head down to Cape Town for the L'Ormarins Queens Plate taking place on the 10th of January 2015. The Queen’s Plate is the most exclusive horse race in South Africa with a price tag of R1,5millon. There are only 1500 tickets for sale and attendees must wear blue and white attire. Flights listed below depart on the 9th of January 2015. 27 Nov 2014: SAA is running an “Instant Upgrade” special where if you buy a full economy class ticket you will be reserved in business class. Johannesburg to Durban flights from R2201, Johannesburg to East London from R2372, Johannesburg to Cape Town from R3318*, Johannesburg to Port Elizabeth from R2600*. To book this offer you have to click on the Instant Upgrade button that comes up during the booking process on the FlySAA page. Sale period for this special is until the 31st of January 2015, for flights departing on or before the 31st of December 2015. (*Terms and conditions apply, fares are subject to change, limited availability). 21 Nov 2014: Fly to Cape Town for the Crayfish and Seafood Festival taking place in Paternoster on the 29th of November 2014. The advent of Crayfish season signals summer and all the festivities that come with it. We can't think of a better way to kick-off the holiday season. Flights listed below depart on the 28th of November 2014. 24 Nov 2014: The new SAA ‘Fall Into Savings’ sale offers low-low return airfares for flights to America’s political and financial capitals, New York and Washington DC. Return flights from Joburg to Washington DC start from R10 518* and return flights from the same starting destination (Joburg) to New York start from R10 957*. These prices are available from today until the 9th of December, for travel between the 19th of January and the 10th of March 2015 (*subject to change, limited availability). 14 Nov 2014: Experience the high life at the Le Kap Lifestyle Fair taking place at Blauwklippen in Stellenbosch on the 6th of December 2014. The all-day event includes a fashion show, a Bentley exhibition, show jumping for equestrian lovers and gournmet food and drink that are sure to keep everyone happy. 5 Celebrity chefs and whiskey and brandy educationals will keep your tummy happy. Flights listed below depart on the 5th of December 2014. 7 Nov 2014: Kick start the school holidays with a concert from SA rock legends, Watershed at the Hemingways Casino in East London. You'll be able to rock out to classics like 'Letters' at this special concert. Bring your picnic basket and friends along. If you need more motivation- keep in mind it is for a good cause as profits are in support of the Thembalitsha Foundation. The concert takes place on the 7th of December and flights listed below departs on the 6th of December 2014. 31 Oct 2014: As the year draws to a close we all appreciate a little bubbles, so what could be more appropriate than the Franschhoek Magic of Bubbles festival? Sip on various local and international MCC's and champagnes whilst enjoying some delicious bites produced by local chefs. So keep the weekend of the 29th and 30th of November 2014 open. Flights listed below depart on the 28th of November 2014. 24 Oct 2014: Ready to rock it out to the Kings of Chaos and their esteemed guests? If you haven't yet got tickets you better spark as this is sure to be one memorable concert. Kings of Chaos return to South Africa with special guests Steven Tyler from Aerosmith, Duff McKagan from Guns and Roses and others joining them on stage for the first time in South Africa. The concerts take place in Johannesburg, Sun City in on the 29th and 30th of November and in the Grand West Arena in Cape Town on the 3rd of December 2014. Flights listed below depart on the 28th of November 2014. 17 Oct 2014: Two of the most succesfull contemporary South African singers, Jack Parow and Francois van Coke will share a stage on the 17th of November in an intimate concert. If you're lucky enough to be in Pretoria or close by make sure that you don't miss out. They will be supported on stage by guitarists Louwtjie Rothman and Jedd Kossew. Flights surveyed depart on the 16th of November 2014. 10 Oct 2014: One of South Africa's most beloved musicians will be rocking the roof off with his band on the 30th of November 2014 at the Walter Sisulu Botanical Gardens. Tickets cost only between R75 and R180, at this price its a steal. The following survey was done for flights on the 29th of November 2014. 3 Oct 2014: Are you a runner? Then the Stellenbosch Farm Race on the 25th of October 2014 is for you. This race will take you through arguably the most scenic farmland in South Africa, the Stellenbosch Winelands. The race starts on the Beau Joubert Wine Estate and runs through 4 other estates. The views from the track over the Helderberg, Stellebosch Valley and Table Mountain afar is truly breath-taking. The following survey was done for flights on the 24th of October 2014. 18 Sep 2014: Ready to get your poetry on? This year's McGregor Poetry Festival taking place from the 23rd to the 26th of October 2014 promises to be a festive affair celebrating and encouraging the creative juices. Don't expect endless poetry slams as as they will also be screening an Opera Film, have a delicious pub dinner and present a poetry workshop. The event also promises to be fun for the whole family with various child activities. Flights listed below depart on the 22nd and return on the 30th of October 2014. 12 Sep 2014: Cape Town once again plays host to one of the world’s most popular plays, The Rocky Horror Show. The show runs until the 1st of February 2015. Why not make a weekend of it and watch the Sharks play Western Province at Newlands on Friday the 10th of October and then head to the Fugard Theatre for the Rocky Horror Show on Saturday the 11th of October 2014. Sound like a great weekend to us! 4 Sep 2014: Have you got a keen fashion sense? Then you’ll probably give an arm and a leg to attend South African Fashion Week taking place from the 15th to 17th of October 2014 in Johannesburg. Luckily it is not necessary! With some of the best and most prestigious designers showcasing their collections this year the show promises to be one of the hottest events on the fashion calendar. Flights listed below depart on the 14th and return on the 19th of October 2014. 29 Aug 2014: Experience the Magic of Bubbles in Franschhoek on the 29th to 30th of November 2014. Enjoy some of the finest Methode Cap Classiques and French Champagnes in one of the festival’s tents. The whole town gets lured into the magic of the festival with top restaurants preparing special tasting menus to pair with some of the finest imported bubbles. Don’t forget to try a champagne truffle at the chocolate factory shop! Flights listed below depart on the 28th of November and return on 5th of December 2014. 28 Aug 2014: 2 Day Madness Sale! Although the initial 5 days has come and gone SAA has extended it for another 2 days! Fly to one of their 26 destinations around the world from the 1st of September until 31st of March 2015. There are one-way flight specials for domestic flights and return flight specials for international flights. All airfare specials are for flights from Johannesburg. One-Way domestic prices start at R944* from JNB to Durban, JNB to PE from R1144* and JNB to CPT from R1316*. Regional return flights start at R4053* from JNB to Harare, R3141* from JNB to Windhoek, R3794* from JNB to Livingstone and R5492* from JNB to Mauritius. There are also some great airfares available to various international destinations. These fares start at R9442* from JNB to Hong Kong, R9587* from JNB to Beijing and R12206* from JNB to Washington. Travellers only have 2 days to access these great airfares so move quickly and book to avoid missing out! 22 Aug 2014: The Afrikaans is Groot festival is taking place in Pretoria from the 14th to the 25th of November. This is your opportunity to catch up on the best Afrikaans music from artists like Juanita Du Plessis, Theuns Jordaan, Corlea Botha, Eden, Robbie Wessels and many more! Flights listed below depart on the 13th of November and return on the 26th of November 2014. 8 Aug 2014: Looking to grow your wine collection? Then head to the Nedbank Cape Winemakers Guild Auction on the 4th of October 2014 at Spier. This is the Guild’s 30th annual auction and has some of the best and most exclusive local wines on sale. Flights listed below depart on the 3rd and return on the 10th of October 2014. The reason that the JHB-MRU flight is so expensive is because economy class is sold out. 25 July: Appreciate the finer things in life at the Klein Karoo Klassique from the 14th to the 17th of August 2014. Enjoy some of the best wines from the region whilst listening to classical performances. Artists from the Klein Karoo like Thijs Nel and Francois Gerber will also be exhibiting some of their pottery and paintings during the week. So for the best wines, food and art in the region head to Oudtshoorn. Flights listed below depart on the 12th and return on the 17th of August 2014. 18 July 2014: Want to get a taste for Johannesburg? Then head to Montecasino for the Pick n Pay Taste of Joburg from the 25th to the 28th of September 2014. Enjoy delicious dishes prepared by twelve of Johannesburg’s top chefs and live demonstrations teaching you how to incorporate seasonal fruit and vegetables into your meals. You’ll also be able to pair some Pick n Pay wines with delicious canapés. Flights listed below depart on the 24th of September and return on the 1st of October 2014. 11 July 2014: Even though we’re still freezing, summer is just around the corner! The Robertson Wine on the River taking place from the 17th to the 19th of October is the perfect opportunity to celebrate this. Bask in the sun on the Breede Rivier river bank and enjoy a glass of wine from one of 42 different wineries. Relax with live music, good food and great company. Flights listed below depart on the 17th of October and return on the 24th of October 2014. 3 July 2014: The mighty Springboks will be playing their arch rivals New Zealand on the 4th of October 2014. The game will take place in Johannesburg on Ellis Park, the spiritual home of South African Rugby. This match is a replay of South Africa's most famous victory when they beat the same side in 1995 to win the Rugby World Cup (on the same field) for the first time. Flights listed below depart on the 3rd of October 2014 and return on the 10th of October 2014. The Johannesburg to Mauritius flight is very expensive because there is only a business class flight available on the return route. 27 June 2014: Fly to Johannesburg for the Good Food and Wine Show taking place from the 31st of July to the 3rd of August 2014. Both international and local celebrity chefs will come together to compete for your taste buds’ attention in the Coca-Cola Dome. We think the SAA cooks also deserve some love for their delicious in-flight meals. Flights listed below depart on the 30th of July 2014 and return on the 6th of August 2014. We have found that international flights are cheaper when you book closer to the departure times, although you do run the risk of flights selling out. 20 June 2014: The McGregor Food and Wine Festival is taking place on the 30th of August 2014 in this beautiful wine district. Fly to Cape Town and head to foodie and wine heaven after sampling the chicken or beef in-flight. Flights listed below depart on the 29th of August 2014 and return on the 5th of September 2014. Local flight prices have remained very consistent these last few weeks. 6 June 2014 : Travel in comfort to Johannesburg for Decorex, Africa's premier design and decor show, taking place on the 6th of August in Midrand. We hope that you won’t be inspired by the aircraft interiors! Flights listed below depart on the 4th of August and return on the 11th of August. Whilst local airfares have remained relatively consistent, we've found that in most circumstances it is better to book international flights further in advance. 30 May 2014 : Take a quick flight from Johannesburg to Cape Town for the Die Burger Mountain Bike Challenge taking place on the 2nd of August in Stellenbosch. Remember to make the best of the free meals offered in flight and carbo-load before the race. Flights listed below depart on 1 August and return on the 8th of August. It’s good to see that most of the airfares have decreased since the previous survey. 15 May 2014 : Get 5% off your next flight from South Africa to Mumbai with SAA’s latest special. Simply enter the promotional code flymetoMumbai and you can be off to enjoy some of the best curries on earth, excluding Durban off course. This includes flights from Cape Town, Durban and Johannesburg. This is only applicable for flight bookings between 12 and 18 May 2014. Terms and conditions apply. 13 May 2014 : Sit back and relax on during your South African Airways flight to Cape Town. You will need to conserve your energy in preperation for the Cape Town Marathon, which takes place on the 20th of September 2014. 02 May 2014 : Break out your running shoes and limber up in preparation for the Comrades Marathon, which takes place in Pietermaritzburg on the 1st of June 2014. Please refrain from running laps up and down the aircraft during your South African Airways flight to Durban. Flights listed below depart on the 30th of May 2014, and return on the 3rd of June 2014. 16 April 2014 : Head to Brakpan, Johannesburg where you can experience the high octane thrills of the Gauteng Motorshow, which takes place on the 25th of July 2014. Just don't try to wear your racing helmet during your SAA flight to Johannesburg. CPT - JNB from R2,570*, DUR - JNB from R2,140*. 15 Apr 2014 : Just type in the promo code flymetoLondon when you book at SAA and the airfare you see will be 5% cheaper than if you didn't. This is for flights from OR Tambo, CPT & DUR to London. It only works on classes C, J, Z, D, Y, M, B, K, H & S. And also only for bookings from the 14th to the 20th April 2014. Terms & conditions apply. 11 April 2014 : The KZN Winter Air Tour takes flight during the months of May, June and July 2014. So hop onto an SAA flight to Durban, then head to Pietermaritzburg where you can enjoy the action that takes place on the 7th of June 2014 (there are other spots in KwaZulu-Natal where the airshow also takes place). To enter you must, before 31 March 2014, email dumodenga@flysaa.com saying (1) that SAA Voyager is the loyalty program celebtrating its twentieth anniversary in 2014, and (2) that the Tsogo Sun Beverly Hills will be celebrating its fiftieth anniversary this year. Up for grabs is a two night stay at the iconic Beverly Hills and 38,000 Voyager Miles with South African Airways. To celebrate the 20th anniversary of the Voyager Program, 20 lucky people who apply & are successful in obtaining an SAA Credit Card during March 2014 and by the 31st March 2014 will get a bonus 20,000 Voyager Miles. It's not often we're offering flight specials for children - if you've got a child who is 8 years old then here's a deal for them. In celebration of South African Airways' 80th birthday, they're offering a bonus 8000 Voyager Miles to any 8-year-old who joins the program during March 2014. 02 April 2014 : The Splash Festival takes place from the 18th to the 20th of April 2014, at Nelson Mandela Bay. So don't forget to pack your beachwear for your flight to Port Elizabeth. Flights from CPT to PE are R3,615*, and from DBN to PE are R4,014*. 11 March 2014 - The Johannesburg Travel Festival takes place from the 5th to the 6th of April 2014, at the Sci-Bono Discovery Centre. So book a flight to Johannesburg with South African Airways, the preferred partner airline of the Travel Festival. Flights from CPT to JNB fare R2955*, and flights from DUR to JNB are R2122*. There'll be presentations on Azerbaijan, Croatia, Cuba, Hungary and Poland. 5 February 2014 : Attention all 20-year-olds. If you book and fly SAA during February or March 2014, you will get a bonus 20% Voyager Miles! Remember to specify your Voyager no. when you book. To celebrate the restart of their direct flights to New York; South African Airways have a promotion running until the 8th March 2014. The deal is that you can use promo code JFKNS to obtain a 5% discount on the following flights : leaving from the 9th March 2014 from Cape Town, Durban or Johannesburg; and flying to Washington or New York. You must type in the promo code when booking. 06 March 2014 - Travel to Durban with South African Airways, where you can enjoy the high octane Top Gear Festival. The show takes place on the 21st of June 2014, and showcases cars and bikes, as well as including stunts. And don't worry, your SAA flight to Durban will not be included in the show. Flights depart on the 20th of June, and return on the 23rd of June 2014. 03 March 2014 - Iron Man South Africa takes place on the 6th of April 2014, in Port Elizabeth. But you won't have to travel there via bicycle to prove that you are toughest person in SA, as you can fly with South African Airways instead. Flights from CPT - PLZ are R3,788*, from DUR - PLZ are R4,038*, and flights from JNB - PLZ are R3,345. 5 February 2014 - A South African Airways flight isn't the only thing that will lift your spirits, especially if you are headed to the Coffee and Chocolate exposition. The exposition takes places at the Montecasino in Johannesburg, from the 17th to the 20th of July 2014. Just try not to overindulge too much caffeine and sugary treats or you'll be bouncing off the plane walls on your return flight. Flights from CPT - HLA are R2558*, from CPT - JNB are R2654*, and from DUR - JNB are R2128*. 18 February 2014 - The Taste of Cape Town festival celebrates it's seventh anniversary on the 3rd of April 2014, at the Green Point Cricket Club. So make sure you have brought your appetite along on your flight to Cape Town. Just don't fill up on the award-winning in-flight snacks. Flights from OR Tambo to Cape Town are from R2,684*, and flights from DUR - CPT are R3,064 (note that these are a codeshare with SA Express and Mango Airlines). Flights depart on Wednesday the 2nd of April 2014, and return on Sunday the 6th of April 2014. 11 February 2014 - Head to the Mother City to enjoy the annual Cape Town International Jazz Festival, which takes place on Friday the 28th March and Saturday the 29th of March 2014. Featuring more than 40 local and international artists, if you miss out on this event then you will feel like playing the Blues. Flights from JNB - CPT that depart on the 27th of March, and return on the 31st of March, are R3,866*. 04 February 2014 - The Proteas take on the Aussies at the Sahara Park Stadium in Kingsmead, Durban, on Wednesday the 12th of March 2014. The prices that we have collected won't hit your wallet for six, and they depart on Monday the 10th of March 2014, and return on Friday the 14th of March 2014. OR Tambo is going for R2128* return and Cape Town to King Shaka was R3291* return. 29 January 2014 - Fly out on 24 Sep & back on 28 of Sep because you know what happens on the 24th - South Africa's favourite public holiday - braai & tjops day, or to think about other parts of your heritage. Whatever the reason, here are current airfares to get you there and back. And of course on Heritage day you'll want to fly with the national flag on the plane. For fun we had a look at airfares on last year's Heritage Day, and they were higher on flights from Jozi to Cape Town, but from Jozi to Durbs. 21 January 2014 - Exercise your human right to an enjoyable flight in March 2014 - and since it's a South African national holiday, who better to fly with than the national carrier? We have gathered the lowest rates that we could find for flights that leave on Friday the 21st of March 2014 (Human Rights day), and return on Sunday the 23rd of March 2014. 08 January 2014 - How should we celebrate the Freedom Day weekend? Here in South Africa we have freedom of speech and freedom of association, so why not take advantage of your right to freedom of movement? Celebrate freedom with a full service South African Airways flight that departs on Friday the 25th of April, and returns on Freedom day, the 27th of April 2014. 23 December 2013 - Some of us like planning waaaaaaaaaaaaaaay ahead! For those of you looking at the end of next year, these are the lowest prices that we could find, for South African Airways flights that leave on Friday the 14th of November, and return on Sunday the 16th of November 2014. Warning : Low cost carrier fares for November 2014 are not available yet (Kulula & Mango Airlines), so you wont be able to contrast SAA airfares against them. 05 December 2013 - Don't daydream about travelling during October, instead, book an affordable SAA flight. Here are the best prices that we could find, for South African Airways flights that leave on Friday the 10th of October, and return on Sunday the 12th of October 2014. 27 November 2013 - You don't have to be an armchair explorer during April, when you can enjoy an affordable SAA flight. These are the lowest rates for South African Airways flights that leave on Friday the 18th of April, and return on Sunday the 20th of April 2014. 20 November 2013 - Why stay at home during February, when you can enjoy an affordable SAA flight instead? We have collected the cheapest South African Airways flights that we could find, that leave on Friday the 9th of February 2014, and return on Sunday the 12th of February 2014. 12 November 2013 - These are the lowest rates for SAA flights that we could find, that leave on Friday the 8th of August 2014, and return on Sunday the 10th of August 2014. 5 November 2013 - Trying to find an affordable South African Airways flight during July? Here are the cheapest SAA flights that we could find, that leave on Friday the 4th of July 2014, and return on Sunday the 6th of July 2014. 29 October 2013 - Wondering what to do during June? Perhaps a flight with South African Airways will help to pass the time. Here are the lowest prices that we could find for SAA flights that leave on Friday the 6th of June 2014, and return on Sunday the 8th of June 2014. 21 October 2013 - Fly with South African Airways during April, and enjoy the lowest rates that we could find for SAA flights that leave on Friday 25th of April 2014 and return on Sunday the 27th April 2014. 11 October 2013 - Enjoy a change of scenery during November, by booking a cheap South African Airways flight. Take advantage of the lowest prices that we could find for SAA flights that leave on Friday the 22nd of November 2013, and return on Sunday that 24th of November 2013. 7 October 2013 - Plan far ahead - take the kids on an affordable adventure during the March 2014 school holidays. Here are the lowest prices that we could find for South African Airways flights that leave on Friday the 28th of March 2014 and return on Sunday the 30th of March 2014. 2 October 2013 - Looking for a cheap South African Airways flight during November? These are the best rates that we could find for SAA flights that leave on Friday the 1st of November 2013, and return on Sunday the 3rd of November 2013. If East London is your destination, then don't miss out on the Absa Vuka Showcase, which is a celebration of art, music, and cuisine. 27 September 2013 - October doesn't have to be a dull month, why not enjoy a South African Airways flight to a different destination, these are the lowest prices that we could find for SAA flights that leave on Friday the 11th of October 2013, and return on Sunday the 13th of October 2013. If you are planning a trip to Durban, then don't miss out on the Amashova Pasta Party, which takes place in Umhlanga. 19 September 2013 - Human rights day falls on a Friday next year - so you could possibly also leave on the Thursdays, these are the lowest rates for South African Airways flights that we could find, that leave on Human Rights Day, Friday the 21st of March 2014, and return on Sunday the 23rd of March 2014. 12 September 2013 - There are no public holidays in November but that doesn't mean that you have to stay at home and read a book, here are the lowest prices that we could find for SAA flights that leave on Friday the 1st of November 2013 and return on Sunday the 3rd of November 2013. 7 September 2013 - School Holidays have ended on the 30th of September but that's no reason not to have fun in October - these are the lowest rates for South African Airways flights that leave on Friday the 4th of October 2013 and return on Sunday the 6th of October 2013. Ladies flying from OR Tambo to Accra in August 2013 stand a chance to win Voyager Gold status for a period of 12 months. 2013-08-30 These are the lowest prices for South African Airways flights that leave on Friday the 20th of September 2013 and return on Sunday the 22nd of September 2013, just in time to enjoy Heritage day which takes place on Tuesday the 24th of September 2013. 2013-08-14 Enjoy a long weekend in December thanks to Reconciliation day, these are the lowest prices for South African Airways flights that leave on Friday the 13th of December 2013 and return on Monday the 16th of December. 2013-07-26 South African Airways is running a 5 day sale to 26 destinations. Sale ends on the 30th July 2013. Fly from Johannesburg to Durban from R1896*, Johannesburg to East London from R2036*, Johannesburg to Cape Town from R2489*, Johannesburg to Lusaka from R3769*, Johannesburg to Harare from R3820*, Johannesburg to Bujumbura from R4068*, Johannesburg to Kigali from R4338*, Johannesburg to Ndola from R4669*, Johannesburg to Luanda from R4677*, Johannesburg to Kinshasha from R4738*, Johannesburg to Dar es Salaam from R4829*, Johannesburg to Entebbe from R5342*, Johannesburg to Lagos from R5581*, Johannesburg to Accra from R5685*, Johannesburg to Nairobi from R5978*, Johannesburg to Mumbai from R5998*, Johannesburg to Cotonou from R6087*, Johannesburg to Brazzaville from R6522*, Johannesburg to Pointe Noire from R7592*, Johannesburg to Beijing from R8552*, Johannesburg to London from R9143*, Johannesburg to Buenos Aires from R9287*, Johannesburg to Munich from R9460*, Johannesburg to Frankfurt from R9631*, Johannesburg to Perth from R10295*, Johannesburg to Sydney from R11515*. 2013-07-22 Here's the cheapest SAA flights on Friday the 13th September 2013 (hehe - do you dare with two 13's in the date!) and returning on Sunday the 15th September 2013. This will get you to the Fork & Cork Festival in Wellington Cape Town (takes place on the 14th September 2013). 2013-07-16 Here's the cheapest SAA flight prices leaving on the 8th November and returning on the 10th November 2013. If you're heading to Durbs, this will get you to the Durban Motor Show. Book an Avis car through South African Airways' website during June and July, and you stand the chance to win a holiday to the Seychelles or a stay at a Thornybush Collection Lodge. If you're an SAA Voyager member fly SAA from Johannesburg to Maputo (and back) on SA 146 or SA 147 between 1 March and 31 July 2013, and earn Double Voyager Miles - T&Cs apply. 2013-07-04 The Women's Day long weekend is drawing closer. Here's a look at the cost of SAA's cheapest return flights, leaving on the 8th August and returning on the 11th August 2013. 2013-06-30 Having a look at the cheapest SAA flights leaving on the 18th and returning on the 20th October (the dates of the Mossel Bay Travel Festival). 2013-06-22 It's been 3 weeks since we last looked at the cheapest South African Airways flights on the 1st January 2014, to get you home with your new year's hangover. Most airfares are slightly up, but Johannesburg to Mauritius flight prices are a bit down. 2013-06-17 Taking another look at SAA flight prices in the school holidays on the 29th June 2013. We last looked at airfares about 30 days ago, and airfares have crept up on all routes, except Johannesburg to Mauritius where there's been a slight drop. 2013-06-10 : Cheapest SAA flight prices on Friday the 14th June 2013, to get away for the long weekend. 30 May 2013. Time to start looking at 2014 flights, starting with this look at the cheapest SAA flights on the 1st January 2014, to get you home after your new year's party. 27 May 2013. It's been 3 weeks since we last looked at SAA airfares on the 24th December 2013. Flight prices on most routes are slightly up, but OR Tambo to Cape Town is slightly down. 23 May 2013. JNB-Beijing from R8422*, JNB-Brazaville from R7196*, JNB-Cape Town from R2338*, JNB-Durban from R1768*, JNB-East London from R1966*, JNB-Harare from R3638*, JNB-Kigali from R4577*, JNB-Kinshasa from R5167*, JNB-Lagos from R5785*, JNB-Lusaka from R3792*, JNB-Maputo from R3415*, JNB-Ndola from R4502*, JNB-Nairobi from R5955*, JNB-Ndola from R4502*, JNB-Pointe Noire from R8346*, JNB-Port Elizabeth from R2132*, JNB-Seychelles from R5708* (operated by Air Seychelles). Two night package to Victoria Falls from R5997*. 10 May 2013. Beauty of India special. To celebrate their codeshare with India's Jet Airways, South African Airways are offering flights from Cape Town to Mumbai from R6524*, Durban to Mumbai from R6324* & Johannesburg to Mumbai from R5812*. There are also flight specials to Delhi, Bengaluru, Chennai, Hyderabad and Thiruvananthapuram. First flight must complete before 31 May 2013. Terms and conditions apply. *Prices will change. 15 May 2013. SAA Voyager members booking with Cruises International by 15 May 2013 get a 5% discount, and may win a 7-night cruise by buying a 7-night cruise. 5 May 2013. Let's have another look at South African Airways flight prices on the 24th December 2013. Other than an increase in Johannesburg to Mauritius & Johannesburg to Victoria Falls airfares, flight prices have been pretty static. South African Airways Voyager members who fly business class return from Johannesburg to Mumbai or Hong Kong between 1 March and 31 May 2013 get entered into a lucky draw and stand a chance of winning 2 business class tickets to Mumbai or Hong Kong, a Bidvest card loaded with R2k and 3 nights stay at an InterContinental Hotel. Insert your Voyager number when booking. 26 April 2013. JHB to Cape Town from R2338*, JHB to Durban from R1768*, JHB to East London from R1966*, JHB to Harare from R3641*, JHB to Kinshasa from R5170*, JHB to Lagos from R5788*, JHB to Lilongwe from R5511*, JHB to London from R8068*, JHB to Lusaka from R3794*, JHB to Maputo from R3371*, JHB to New York from R10308*, JHB to Pointe Noire from R8346*, JHB to PE from R2132*, JHB to Sydney from R12442* (with Qantas), JHB to Washington from R10348*. Three night package holiday to Maputo from R9305*. 19 April 2013. "Super Airfares" Johannesburg to Beijing from R8378*, Johannesburg to Blantyre from R5715*, Johannesburg to Cape Town from R2324*, Johannesburg to Durban from R1754*, Johannesburg to East London from R1952*, Johannesburg to Harare from R3603*, Johannesburg to Lilongwe from R5475*, Johannesburg to Lusaka (Zambia) from R3759*, Johannesburg to Maputo from R3334*, Johannesburg to Nairobi (Kenya) from R4921*, Johannesburg to New York from R10234*, Johannesburg to Port Elizabeth from R2118*, Johannesburg to Washington from R10274*. Cape Town to Dubai from R6816* (codeshare with Emirates Cape Town). Three night package holiday to Mauritius from R7351*. *Prices will change, limited availability. 15 April 2013. The flights around Christmas and New Year are usually expensive. We thought we'd take an early look at how much it costs to get away for your holidays just before Christmas. Here are the cheapest SAA flight prices on the 24th December 2013. 15 April 2013. SAA Voyager members flying to the Women's Advancement Forum may a 5 to 18% discount on South African Airways flights to the forum (subject to availability, T&Cs). Use promotional code WAF2013. 11 Apr 2013. Joburg-Beijing from R8446*, Joburg-Blantyre from R5767*, Joburg-Cairo from R6829* (with Egyptair), Joburg-Cape Town from R2344*, Joburg-Durban from R1774*, Joburg-East London from R1972*, Joburg-Harare from R3658*, Joburg-Lilongwe from R5527*, Joburg-Lusaka from R3810*, Joburg-Maputo from R3388*, Joburg-Nairobi from R4974*, Joburg-New York from R10341*, Joburg-Port Elizabeth from R2138*, Joburg-Sao Paulo from R8765*, Joburg-Washington from R10381*. Four night package to Livingstone from R16842*. Terms & conditions apply. 10 Apr 2013. Looking for a last minute flight to get away this weekend? Here's the cheapest SAA flight prices on the 12th April 2013. Voyager members earn Double Miles when travelling to Nairobi on SA180/181 until 31 March 2013. SAA weekly specials: JHB-Accra from R4833*, JHB-Addis Ababa (Ethiopia) from R7121*, JHB-Beijing from R8436*, JHB-Blantyre from R5783*, JHB-Cape Town from R2313*, JHB-Durban from R1743*, JHB-East London from R1964*, JHB-Entebbe from R5781*, JHB-Harare from R3645*, JHB-Kinshasa from R5182*, JHB-Lilongwe from R5523*, JHB-Lusaka from R3806*, JHB-Nairobi from R5970*, JHB-Ndola from R4516*, JHB-Port Elizabeth from R2108* & JHB-Sao Paulo from R9631* *Very limited availability, and prices will change (perhaps even by the time you read this). Departures/Travel Restrictions from Johannesburg to Harare, Kinshasa, Entebbe, Accra, Blantye, Lilongwe , Ndola, Lusaka,: sales and travel permitted until 30 June 2013. Changes permitted at any time at a charge of ZAR400 per change subject to the same seat availability. Cancellation: any time tickets are non-refundable but any unused fuel levies and regulated taxes are refundable. ZAR400 per change subject to same seat availability. Cancellation: any time tickets are non-refundable but any unused fuel levies and regulated taxes are refundable. Departures/Travel Restrictions from Johannesburg to Beijing: sales and travel permitted until 30 June 2013. Changes permitted at any time at a charge of ZAR1500 per change subject to same seat availability. Cancellation: before departure 25% cancellation fee . After departure tickets are non-refundable. Departures/Travel Restrictions from Johannesburg to Durban, East London, Port Elizabeth and Cape Town: sales and travel permitted until 31 December 2013. Changes at any time permitted at a charge of ZAR342 per change. Cancellation: Anytime tickets are non-refundable but any unused fuel levies and regulated taxes are refundable. Departures/Travel Restrictions from Johannesburg to Sao Paulo: sales and travel permitted until 10 June 2013. Changes are permitted at any time at a charge of ZAR1700 per change subject to same seat availability. Cancellation: Anytime tickets are non-refundable but any unused fuel levies and regulated taxes are refundable. Departures/Travel Restrictions from Johannesburg to Addis Ababa: sales and travel permitted until 31 August 2013. Changes permitted at any time at no charge subject to same seat availability. Cancellation: permitted any time at a charge of USD50. SAA weekly specials: JHB-Accra from R5733*, JHB-Beijing from R8330*, JHB-Buenos Aires from R9031*, JHB-Entebbe from R5696*, JHB-Harare from R3562*, JHB-Kinshasa from R5104*, JHB-Lusaka from R3731*, JHB-Nairobi from R5891*, JHB-Ndola from R4441*, JHB-New York from R11702* and JHB-Washington from R11711* *Very limited availability, and prices will change (perhaps even by the time you read this). SAA weekly specials: JNB-Cape Town from R2291*, JNB-Cork from R9747*, JNB-Dublin from R10107*, JNB-Durban from R1721*, JNB-London from R9440*, JNB-New York from R11657*, JNB-Shannon from R10087*, DUR-Cork from R10547*, DUR-Dublin from R10907*, DUR-London from R10240*, DUR-New York from R12051* & DUR-Shannon from R10887* *Very limited availability, and prices will change (perhaps even by the time you read this). SAA weekly specials: JNB-Beijing from R7930*, JNB-Buenos Aires from R7988*, JNB-Brazzaville from R7173*, JNB-Harare from R3583*, JNB-Kigali from R4185*, JNB-Lusaka from R3741*, JNB-Mumbai from R7930*, JNB-Nairobi from R5902*, JNB-New York from R10735* and JNB-Washington from R10245* *Very limited availability, and prices will change (perhaps even by the time you read this). SAA weekly specials: JNB-Buenos Aires from R9122*, JNB-Beijing from R7980*, JNB-Brazzaville from R7207*, JNB-Harare from R3621*, JNB-Kigali from R4221*, JNB-Kinshasa from R5151*, JNB-Lusaka from R3775* and JNB-Nairobi from R5939* *Very limited availability, and prices will change (perhaps even by the time you read this). SAA weekly flight specials: JNB-Buenos Aires from R9015*, JNB-Beijing from R7892*, JNB-Dar es Salaam from R4870*, JNB-Harare from R3558*, JNB-Nairobi from R5878* *Very limited availability, and prices will change (perhaps even by the time you read this). SAA weekly flight specials: JNB-Buenos Aires from R8321*, JNB-Beijing from R9396*, JNB-Cape Town from R2267*, JNB-Durban from R1697*, JNB-East London from R2032*, JNB-Frankfurt from R7351*, JNB-Hong Kong from R8980*, JNB-London from R7985*, JNB-Munich from R7196*, JNB-New York from R10630*, JNB-Perth from R10676*, JNB-Port Elizabeth from R2062*, JNB-Sao Paulo from R8757* and JNB-Washington from R10069*. *Very limited availability, and prices will change (perhaps even by the time you read this). South African Airways' 2nd set of weekly specials this year. Joburg-Harare from R3498*, Joburg-Kigali from R4105*, Joburg-Livingstone from R3184*, Joburg-Lusaka from R3664*, Joburg-Mumbai from R5621*, Joburg-Nairobi from R5821*, Joburg-Beijing from R7396* and Joburg-Victoria Falls from R3358*. *Very limited availability, and prices will change (perhaps even by the time you read this). Here we go! The first SAA flight special of 2013. Joburg-Harare from R3465*, Joburg-Kigali from R4074*, Joburg-Kingshasa from R5003*, Joburg-Lagos from R5598*, Joburg-Libreville from R6480*, Joburg-Livingstone from R3153*, Joburg-Lusaka from R3343*, Joburg-Nairobi from R5789*, Joburg-New York from R11416* and Joburg-Victoria Falls from R3325*. *Very limited availability, and prices will change (perhaps even by the time you read this). JNB-Beijing from R7480*, JNB-Buenos Aires from R9668*, JNB - Harare from R3563*, JNB-Hong Kong from R10,810*, JNB-Kigali from R3432*, JNB - Kinshasa from R4495*, JNB-Lagos from R4994*, JNB-Libreville from R6584*, JNB-Lusaka from R3432*, JNB-Pointe Noire from R8198* *Very limited availability, and prices will change (perhaps even by the time you read this). SAA 72 hour domestic summer holiday sale, running from the 28th to the 30th November 2012. JNB to Durban from R855*, JNB to East London from R1026*, JNB to Port Elizabeth from R1038*, Durban to Johannesburg from R821*, East London to JNB from R1016* and PLZ to JNB from R1038*. *Above fares are on a one way basis, inclusive of all taxes and are subject to availability and change due to currency fluctuations. South African Airways can at any time change/discontinue these special fares and conditions without prior notice. Fare subject to availability. Combinable with any other fare class. This special is not available on the following flight series 1000-1999 and 8000-8999 Tickets must be paid for 24 hours after confirmation Tickets are non refundable except any unused fuel or taxes are refundable Rebooking permitted. Any Time - Permitted at a charge of : Adults : ZAR 342 per change subject to seats being available No Name changes allowed after ticketing. Rerouting and Standby is not permitted.Children pays 75% of the adult fare. Voyager Miles can be earned at 50% of normal miles as per this special. South African Airways Special Fares: JNB to Harare from R3542*, JNB to Kinshasa from R4476*, JNB to Nairobi from R5863*, JNB to Libreville from R6540*, JNB to Kigali from R5816*, JNB to Lagos from R5681*, JNB to Durban from R1703* & JNB to Dubai from R6626*. *very limited availability, and prices may have changed. South African Airways Special Fares to Washington. JNB to Washington from R9501*, CPT to Washington from R9805*, DUR to Beijing from R9893*, PLZ to Beijing from R9893*, ELS to Beijing from R9886*. *very limited availability, and prices may have changed. South African Airways Special Fares to Beijing. JNB to Beijing from R7434*, CPT to Beijing from R7826*, DUR to Beijing from R7826*, PLZ to Beijing from R7826*, ELS to Beijing from R7816*. *very limited availability, and prices may have changed. SAA Summer 72 hour sale for sale on selected flights until 15 Jan 2013. Limited availability. JNB-Cape Town from R2277*, JNB-Durban from R1707*, JNB-East London from R2039*, JNB-Luanda from R4940*, JNB-Mauritius from R5225*, JNB-Port Elizabeth from R2072*, JNB-Washington from R9574*; *very limited availability, and prices may have changed. JNB-Brazzaville from R6885*, JNB-Harare from R3450*, JNB-Kinshasa from R4389*, JNB-Lusaka from R3620*, JNB-Beijing from R7329*, JNB-Mauritius from R5090* JNB-Perth from R10021*; *very limited availability, and prices may have changed. JNB-Harare from R3420*, JNB-Kinshasa from R4361*, JNB-Luanda from R4800*, JNB-Lusaka from R3591*, JNB-Windhoek from R2636*, JNB-Beijing from R7293*, JNB-Perth from R9980*; *very limited availability, and prices may have changed. JNB-Harare from R3427*, JNB-Kinshasa from R4967*, JNB-Luanda from R4807*, JNB-Lusaka from R3589*, JNB-Windhoek from R2640*, JNB-Beijing from R7101*; *very limited availability, and prices may have changed. JNB-Harare from R3417*, JNB-Kinshasa from R4958*, JNB-Luanda from R4797*, JNB-Lusaka from R3587*, JNB-Mumbai from R5375*, JNB-Perth from R9745*, JNB-Washington from R9819*, JNB-Sydney from R10092*; *very limited availability, and prices may have changed. JNB-Abidjan from R5725*, JNB-Brazzaville from R6881*, JNB-Harare from R3458*, JNB-Lusaka from R3712*, JNB-Luanda from R4835*, JNB-Mauritius from R5798*, JNB-Hong Hong R8475*, JNB-Sydney from R10154*; *very limited availability, and prices may have changed. JNB-Abidjan from R5731*, JNB-Brazzaville from R6881*, JNB-Dar es Salaam from R4709*, JNB-Luanda from R4842*, JNB-Lusaka from R3719*, JNB-Washington from R9819*, JNB-Windhoek from R2664*; *very limited availability, and prices may have changed. JNB-Abidjan R5694*, JNB-Brazzaville R6834*, JNB-Dar es Salaam from R4753*, JNB-Kinshsa R4979*, JNB-Lusaka R3609*, JNB-Nairobi from R5125*, JNB-Windhoek from R2648; *very limited availability, and prices may have changed. JNB-Frankfurt R6034*, JNB-Lusaka R3573*, JNB-Mumbai R5360*, JNB-Perth R10620*, JNB-Sydney R11978, JNB-Washington R622, JNB-Windhoek R2622; *very limited availability, and prices may have changed. JNB-Abidjan R5666*, JNB-Brazzaville R6794*, JNB-Frankfurt R6047*, JNB-Lusaka R3578*, JNB-Maputo R3151*, JNB-Mauritius R5708*, JNB-Munich R5926, JNB-Windhoek R2626; *very limited availability, and prices may have changed. SAA specials: JNB-Abidjan R5652*, JNB-Brazzaville R6799*, JNB-Dar Es Salaam R4725*, JNB-Kinshasa R4953*, JNB-Lagos R5540*, JNB-Lusaka R3584*, JNB-Perth R10496, JNB-Sydney R10846; *very limited availability, and prices may have changed. SAA specials: JNB-Abidjan R5471*, JNB-Beijing R7148*, JNB-Brazzaville R6848*, JNB-Dar Es Salaam R4776*, JNB-Kinshasa R5001*, JNB-Lagos R5595*, JNB-Lusaka R3631*, *very limited availability, and prices may have changed. Johannesburg to Munich from R5925, to Frankfurt from R6045 and to Maputo from R3146. South African Airways September flights price snapshop. To celebrate 60 years of flying from South Africa to Frankfurt, SAA are offering some great flight specials on the route, for booking for travel from the 14th No to the 14th Dec 2012, and during February 2013. Very limited availability. South African Airways specials from Johannesburg to London (R7233), JNB to Hong Kong (R8741), JNB to Munich (R6084) and JNB to Frankfurt (R6290). They're also running a special on their new Johannesburg to Abidjan (Ivory Coast) route. South African Airways Johannesburg to Durban 48 hour sale. The cheapest but most restrictive price was R828. SAA weekly flight specials including R10929 to Sydney, R6170 to Munich and R8270 to Hong Kong. Fly JNB to Livingstone from R2997, JNB - Lusaka from R3677 and JNB to Windhoek from R2708. International flight specials from South African Airways. Johannesburg to Sydney from R10,644; JNB to Perth from R9471. Johannesburg to London from R7054, to Beijing from R6919 & to Dubai from R7593. JNB to Accra from R5498, to Kinshasa from R4933, to Lusaka from R3567 and to Dar es Salaam from R4621. JNB to Lagos from R5538, DUR to Dubai from R6498 & Johannesburg to Harare from R3565. South African Airways are running a May Madness special, with R2168 JNB-CPT return flights, and specials all over the world. SAA specials to Frankfurt from R6998, to London from R6958, Sydney from R10,595 & Perth from R9410. SAA flight special to Washington from R9240, New York from R9240, London from R8040, Harare from R3313 and Hong Kong from R8213. SAA offers JNB-Beijing from R6827, JNB-Luanda from R4559 & JNB-Dubai from R6578 (the Dubai flight is really a codeshare with Emirates). South African Airways special for flights to Beijing and June 2012 flight prices. With December's high flight prices full service carriers are sometimes the cheapest. SAA summer sale on international flights (including some African routes). SAA 72 hour sale on international flights to London, New York, Washington, Sao Paulo & Buenos Aires. South African Airways flight prices in October 2011. SAA July flight prices have largely come down on the JNB-CPT and JNB-DUR routes with intense price competition, led by newcomer, Velvet sky. flySAA - cheapest flights on each day in July 2011. JNB-CPT and JNB-DUR cheapest on the 2nd July. Cheapest South African Airways flights on each day in May 2011. SAA cheapest flight offers on each day in March 2011. Cheapest daily SAA flight offers in April 2011. Cheapest daily SAA flight offers in Jan. Cheapest daily SAA flights in Feb. Cheapest SAA flight on each day in December. SAA R4630 to London & change in operational routes for its Airbus A330-200. South African Airways special for international flights, from its October newsletter. Cheapest daily flight prices for SAA in Nov 2010. Cheapest daily flight prices for South African Airways in October 2010. Comparison of SAA daily cheapest flight prices in January 2011. Not an official special, just a snapshop of SAA's September flight prices from Joburg to Kimberley, Cape Town & Durban, Port Elizabeth, Bloemfontein. Not an official special, just a snapshop of SAA's December flight prices from Joburg to Kimberley, Cape Town & Durban. SAA domestic flight specials and also a London to Johannesburg flight sale. In support of Bafana Bafana's efforts at the World Cup, SAA run a flight special. Todd Malone's complains that it's nearly impossible to find a flight for SAA Go Fares. South African Airways argued that the advert doesn't fall in the jurisdiction of the Advertising Standards Authority, as it was for international flights intended for the non-SA market, but ASA said that jurisdiction resides in the area where control over the advertising is exercised. SAA undertook to amend its advertising. Reservations may be booked at SAA.